I drove a few other desert roads on my return from Vegas. 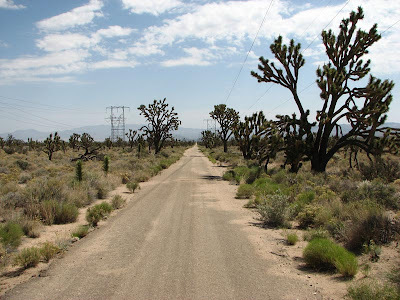 I decided to drive some powerline roads south of Nipton, CA in the Ivanpah valley. 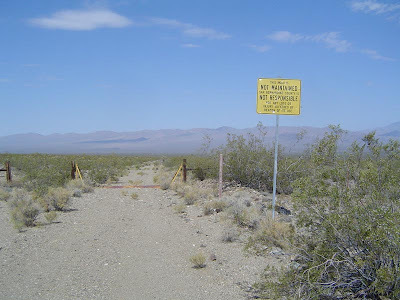 It was fun and interesting ... and a bit different than most powerline roads in the desert. For one thing, this one was paved with asphalt ... kind of. There was, of course, the random weathering along with the odd total washout. Couldn't go more than 30 mph, so I could slow in time to crawl through those washouts - which were filled with very deep sand (up to 8-9 inches). This washout had handy cones to warn me - but the sand was treacherously deep. Here's a shot of a little leopard lizard that I spotted outside my window as I was consulting my maps. It was about 10-11 inches long. It's pretty well camouflaged. Here's a road I started down, then turned back. It'd been far too long since anybody had driven it and it's much safer if I drive those with another truck (so we can pull each other out of the deep sand). 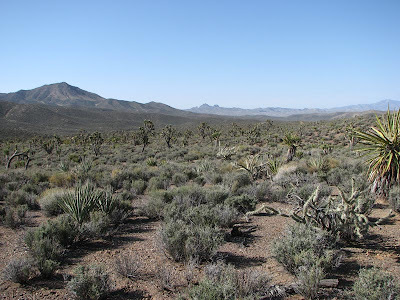 Here's a photo taken from a BLM road east of Nipton. Our country has so much virgin land like this. When I'm there, for some reason, it makes me smile. Finally, here's the crash for this trip. Seems every one of my trips comes across a car crash or such. This time it was a burning truck. An ambulance had arrived and was tending to the adult and child - they looked uninjured but shaken. The fire trucks came a few minutes later. Each time I see these incidents, I count my blessings.